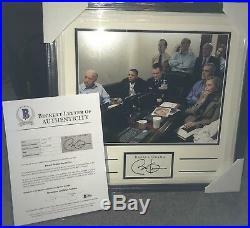 BARACK OBAMA 44TH PRESIDENT SIGNED AUTOGRAPHED PROFESSIONALLY FRAMED CUT AUTOGRAPH WITH 11x14 WAR ROOM PHOTO WITH BECKETT AUTHENTICATION FULL LOA LETTER OF AUTHENTICITY. 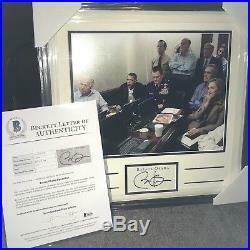 The item "Barack Obama Signed Framed Cut (War Room) 11x14 Photo Beckett BAS LOA" is in sale since Wednesday, December 12, 2018. 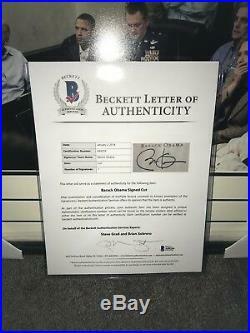 This item is in the category "Sports Mem, Cards & Fan Shop\Autographs-Original\Other Autographed Sports Mem". The seller is "authentix101" and is located in Teaneck, New Jersey. This item can be shipped to United States, Canada, United Kingdom, Denmark, Romania, Slovakia, Bulgaria, Czech republic, Finland, Hungary, Latvia, Lithuania, Malta, Estonia, Australia, Greece, Portugal, Cyprus, Slovenia, Japan, China, Sweden, South Korea, Indonesia, Taiwan, South africa, Thailand, Belgium, France, Hong Kong, Ireland, Netherlands, Poland, Spain, Italy, Germany, Austria, Bahamas, Israel, Mexico, New Zealand, Singapore, Switzerland, Norway, Saudi arabia, United arab emirates, Qatar, Kuwait, Bahrain, Croatia, Malaysia, Brazil, Chile, Colombia, Costa rica, Panama, Trinidad and tobago, Guatemala, Honduras, Jamaica, Viet nam, Uruguay.